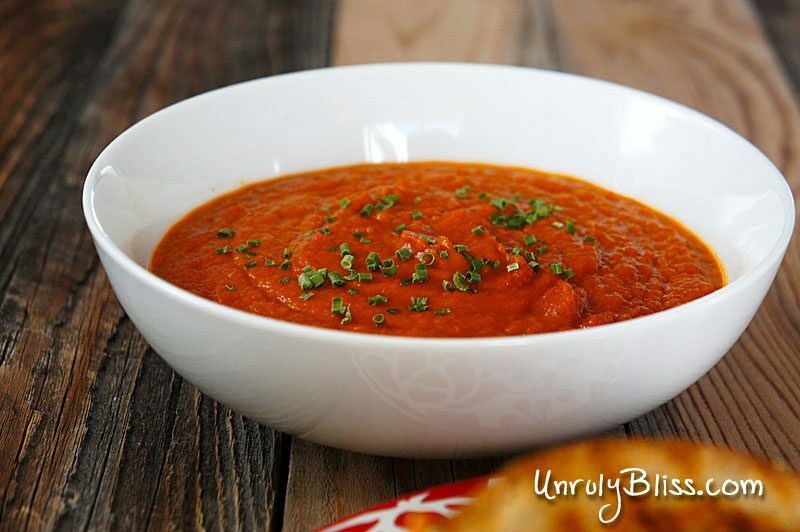 We were browsing through the book for a delicious soup to make when my eyes got really wide after coming to a page with this sun-dried tomato recipe. It had some beautiful lumps of crab on top of it. 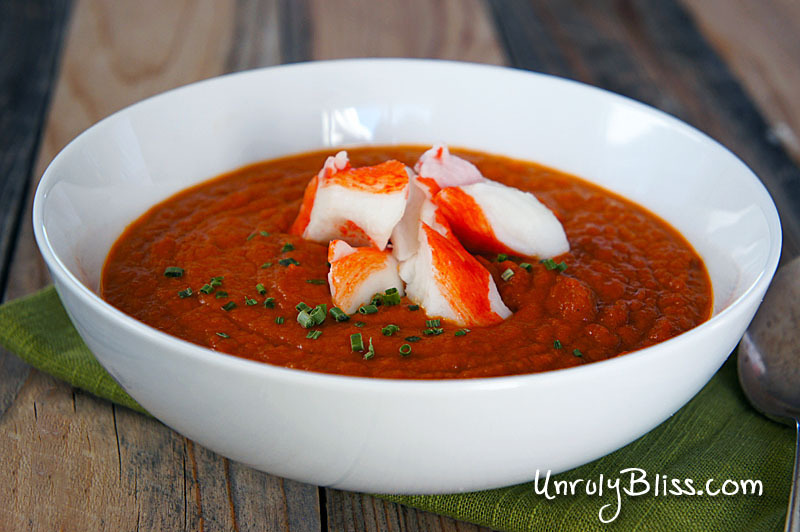 I would have never thought to add that to a soup like this, but the crab meat was amazing on top of the soup! The mild flavor of the crab went so well with the strong flavors of the soup. 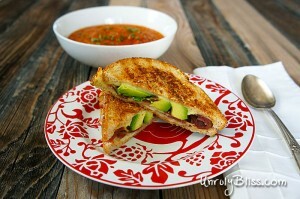 And as for the grilled cheese sandwich…it is definitely the best one I’ve ever had. Justin crusted both slices of bread with Parmesan cheese for a little added crispiness and the avocado and prosciutto were delicious with the cheese. In a large saucepan, melt the butter over medium-high heat. Add the shallots and saute them until soft, about 5 minutes. Add the sun-dried tomatoes, diced tomatoes, and broth and bring it all to a boil. Return the soup to the saucepan over low heat and add in the cream. If you’re using bacon, go ahead and cook that first (don’t with prosciutto). 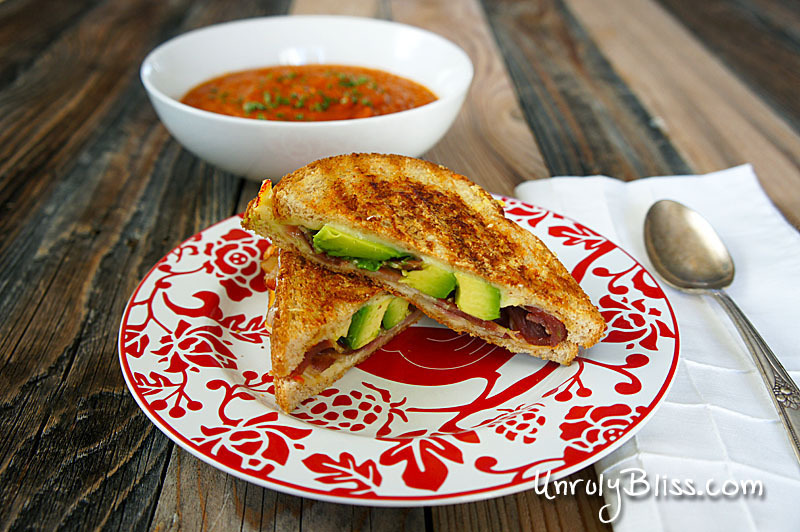 Set aside the bacon to cool while you prep your sandwiches. Heat up a heavy skillet or grill pan on medium heat. Lay your 4 slices out in front of you and coat 1 side of each slice with butter. Sprinkle some grated Parmesan on the sides with the butter until it’s fully coated with cheese. Assemble the second bread slice on top and place the sandwiches in your pan. 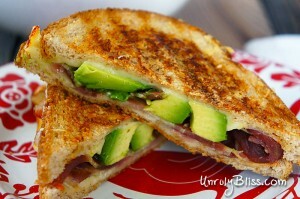 Let the sandwiches sit on the heat until the Parmesan is golden and crispy (time varies so keep an eye on the Parmesan). Carefully flip the sandwiches over and crisp up the other side as well. When the Parmesan is crispy and the inside cheeses have melted, remove the sandwiches from the stove and set them aside to cool.